Developers in South Korea took on a challenge: create a smartwatch for blind and visually impaired (B&VI) people that reduces the size, weight and cost of a braille reader by a factor of 10. Link it via Bluetooth to a smartphone so it can receive information in text form from any app or service. Give it full smartwatch functionality: time, timer, alarm, stopwatch, gyroscope, accelerometer, and a 7-day battery life. Have an open API so that anyone can develop apps and services for it. The result? DOT, an elegant smartwatch that will change the way B&VI people can experience daily life. Developed in close relationship to braille educators and with prototypes tested by thousands of B&VI people worldwide, this product fits the actual life experiences and needs of its audience. At a cost of just $290, over 60,000 DOTs have been pre-ordered so far. But the developers haven’t stopped there. In the works are a less expensive version for developing countries; integration of the DOT Active Braille Technology into public facilities like ATMs and transportation hubs; a DOT pad for release in 2017/18; partnerships with Google and Uber. 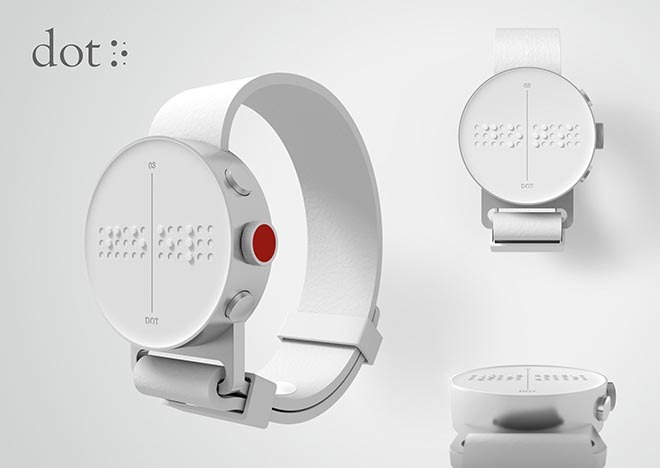 From a simple question: “How can we make braille readers less expensive?” comes a visionary and life-changing solution: DOT, the first braille smartwatch.